I believe he is better known as the Great Svenny (I am far from an expert on Blackmoor), but at any rate, it's available from Havard's Comeback Inn as a free download. RPGPundit Presents #37: Advanced OSR Critical Tables - I don't think critical hits are particularly OSR, though admittedly a common house rule, plus the whole Arms Law thing from ICE. But as EGG pointed out, they end up hurting the players more (since they will get hit more) in the long run. $1.99 and 16 pages. 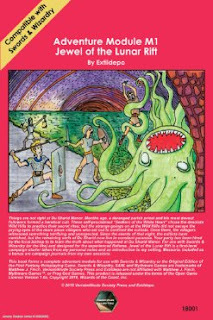 Jewel of the Lunar Rift is a newly released (June 2018) low level module, the first product from Verisimilitude Society Press. Its author, Extildepo, posts on Dragonsfoot, a 1e forum. Despite this, it's for the OD&D clone Swords & Wizardry, though honestly, looking at the stats, it seems like Blueholme or another Holmes clone would be closer, as Dexterity is listed for every monster (which Holmes needs for initiative) and there's made mention of a saving throw vs. Death Ray (while S&W uses a single saving throw for every situation). Although the PDF clocks in at a fairly impressive (for $2, at least) 34 pages, the adventure itself is only about 7 single column pages and 18 rooms. Despite the author mentioning he only wants to give enough background info to run the adventure, it doesn't actually start until page 10 since he gives a lot of background information, not just on the module, but also his house rules and background for his setting. Basically it's a more medieval feel than regular D&D, with a strong church and superstitious peasants. Dunno what the deal is, actually, but the recent AA are down to $3 each at DTPRG. 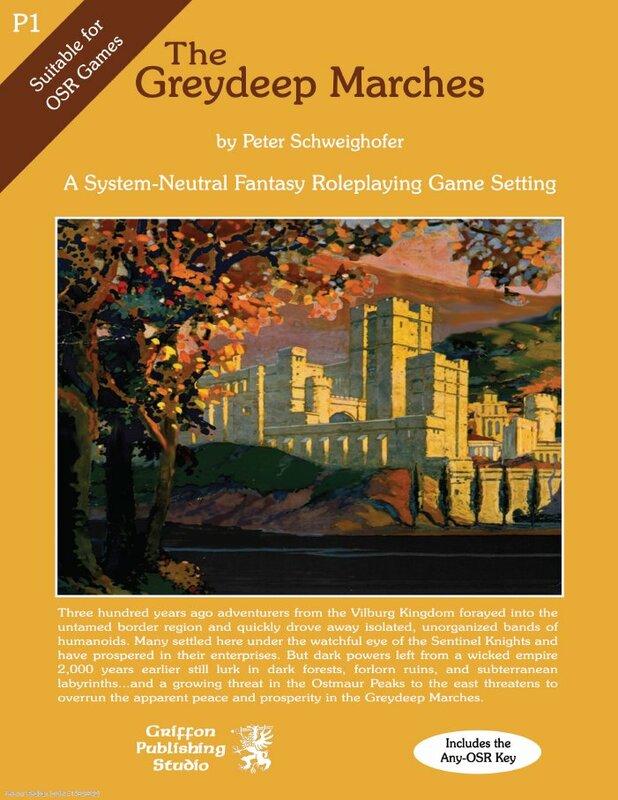 While that is perhaps still a bit pricey compared to the page count (generally 12-16 pages) compared to other OSR modules, bear in mind that they are two column, not one, like a lot of OSR modules, and use fairly tiny print. Often a 16 pages adventure is pretty damn big. 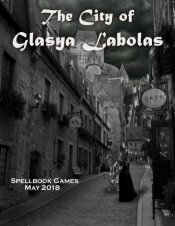 Old School Fantasy Roleplaying: Spontaneous Spellcasting - $1.99 and 7 pages. The Master's Hoard - 22 new magic items. Free! At least in print, with the PDF version coming later. The Four Wives of Xantun: fantasy scenario in the Dreamlands – what haunts the city-state of Hlanith, what does it have to do with lost love, and what is it about those flowers? A Guide to Erillion: an introduction to the Isle of Erillion, a vanilla fantasy mini-campaign setting. Eldritch Experiments: what happens when the PCs find an abandoned laboratory and start experimenting? Gont, Nest of Spies: all is not what it seems in the port town of Gont. 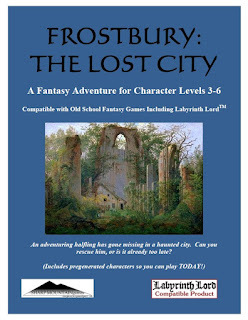 Features adventure hooks, 21 keyed locations, treacherous NPCs and a lot of ways to get into trouble. Down the Smugglers' Walk: the tunnels and dungeons beneath Gont, and the secrets they harbour. 40 keyed locations from underground fighting rings to gateways to other worlds! The Swine Lord: a small wilderness scenario featuring a valley with an unwholesome reputation, and those who aren't bothered by it. 11 keyed locations. Also... a fold-out players' map of the Isle of Erillion, and of the town of Gont! For $8 plus shipping, pretty good deal. After a day, it's funded. Unlike the AEC companion, which was an add on to the basic Labyinrth Lord rules (mimicking the Basic and Expert set) that provided 1e AD&D options like AD&D classes and races not as classes, this will be one simple coherent product for $30 in hardcover. 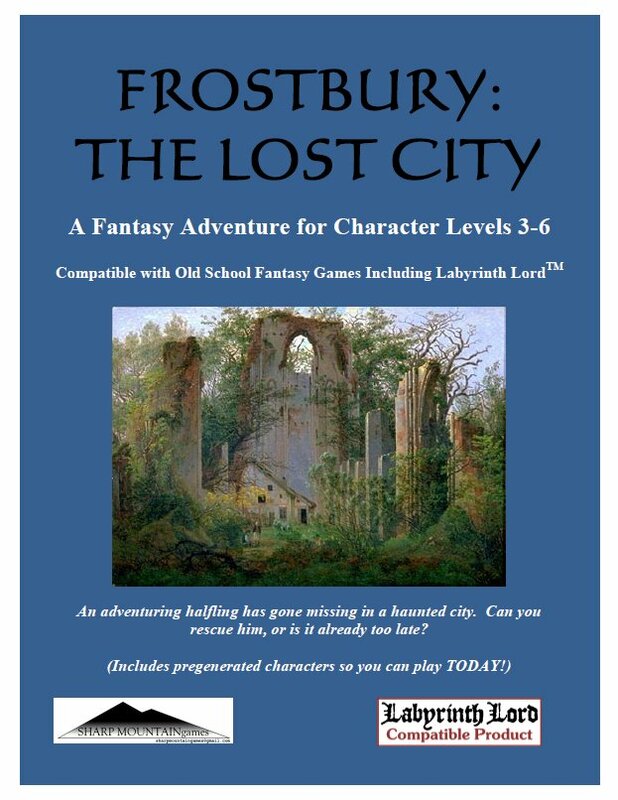 Correction (thanks to James Mishler for pointing this out), it's $30 plus the cost of printing and shipping from DTRPG. So probably closer to $50 (figure 15 for printing and another $5 for shipping, which might still be lowballing) and maybe a better deal to just buy the 1e books on ebay. The Kickstarter is also offering a hardback version of Realms of Crawling Chaos, his book on Lovecraftian D&D (which is for both regular and advanced LL). I reviewed it ages ago and am too tired from work to link to it, but it's solid, though not spectacular. Probably wouldn't pay the $25 for it, and again, it's plus probably another $10-15 buch, so probably $40 or so. I was a pretty big Star Wars D6 fan in the latter days of West End Games. So it was kinda depressing to see them go under, especially as their last products were really top notch. Also sad because it seemed like so many talented people there, artists, writers and editors, left the industry in the aftermath. So when I saw former WEG employee Peter Schweighofer's name on a product at DTRPG, it immediately caught my eye. The Greydeep Marches is essentially a mini-setting, including 3 short adventures, though only one adventure is really tied to the setting. As the name implies, the Marches are a small-ish borderlands duchy that can pretty much be dropped anywhere in your game world, although apparently it's a province of a larger kingdom. As it's only 37 pages, it's really more a sketch of a kingdom. There are 7 or so population centers (including one for elves, one for dwarves, one for halflings), but each basically just gets a paragraph. Some very interesting things this week. Definitely will pick up the adventure and the Arabian Nights book. M1: Jewel of the Lunar Rift - Starter adventure for S&W from a new creator that seems to be an investigation into a manor that was taken over by cultists. $2, 34 pages. The Exodus System - Not about fleeing Egypt, but another "new school" take on "old school". This does promise compatibility will old school modules. $6.99 and 69 pages. The Lexicon of the Throne - Sourcebook for Godbound, which is OSR based, but this doesn't sound like it would be useful for non Godbound games. $9.99 and 91 pages. The Thousand Year Sandglass - Book 1 - From the guy that brought us the fantasy western Mutant Bastards comes this book on Arabian Nights adventures for Labyrinth Lord which includes new classes, monsters, and some adventures. $7, 93 pages. Friday Enhanced Map 6-8-18 - Another cavern from Mr. Hartin. $1. In high school I had to read Dante's (Divine) Comedy, at least parts of it, mostly the Inferno part about Hell and its 9 circles. While largely meant to be political satire of the day, the vivid descriptions and sheer depth of the descriptions of Hell really leaves an impression. Which is why it's remembered so well today and used for some many products - at least books and games. Back in the old days Geoffrey O. Dale must have been similarly captivated, because he released a hex crawl of Dante's Hell, Inferno. Well, more like 4/9s of them. I actually had missed this back in the day, but Fight On! published a 5th circle and it really impressed me. So I've been following Mr. Dale's attempts at continuing his Inferno line (along with Erik Elkmann), despite the fact that the modern releases are not really compatible with D&D, old school or modern, except very vaguely like any fantasy RPG is. Inferno: City of Glasya-Labalos is the latest product in the line, detailing a small city on the plane of Gehenna. The name of the city might be familiar, as it's a "real" name of a devil/demon which EGG re-purposed as the name of Asmoedeus's daughter (Glasya). At 163 pages (plus another booklet with stats for NPCs) it's a remarkably detailed look at the city and its environs, but the level of detail in the city itself comes at the expense of flavor, or even coherence, really. Recovering from an early summer cold, so excuse me if I missed anything this last week. DNH4 Confronting Hastur - This is actually a pretty decent series, albeit with Rick Hershey's terrible art. This is for 10th level characters (and probably higher if not using AD&D based rules). $6.95 and 64 pages, including illustration booklet. Condensed Creature Card Codex for B/X, Labyrinth Lord - Because books are too hard or something. $4.99 and 176 pages of cards. Old School Fantasy Roleplaying: Skills - 10 pages, $1.99. Personally I have grown to like the system from BECMI where you roll under your ability score (if you know the skill) on a d20. It's basically 50% +/- 5% each ability point above or below average. RPGP Presents #34 Misc Wonders of the Last Sun - $2.49 and 13 pages. Alas, this module is not like that. Instead it reminds me a bit of Ramsey Campbell's Inhabitant of the Lake meets Star Frontiers, although not fully developed. Essentially the PCs are hired to find a lost halfling, one who is adventuresome and has not come back from visiting a nearby ruined city by a lake. Both lake and ruins are reported to be haunted and avoided by the halfling community.